Yeyen, a 27-year-old mother of two who lives in Kapuk, West Jakarta, Indonesia, describes the effect an Early Childhood Development (ECD) centre supported by ChildFund and Fronterra, a global dairy company based in New Zealand, has had on her family’s life. “When my first son, Habibie, was only 3 years old, I forced him to read and write. I really wanted him to be ready to go to school. I wanted him to write the letters perfectly, but he wrote them like random drawings. He often cried when I asked him to write properly. It was really difficult. It frustrated me that sometimes I lost my patience and raised my voice, saying that he was a naughty boy. “It was not that I was being mean to my own child, it was just that I really wanted him to be able to read and write so he could be the smart one in school. I really wasn’t aware that what I was doing to my son is not a good age-appropriate practice. I just didn’t know any better. Thankfully, not so long after, when we walked by an ECD centre in our neighbourhood, we saw children learning and playing together. Seeing that, Habibie told me he wanted to play and learn there too. I was surprised because I didn’t even ask him to! I was so happy that I took him to Mentari ECD centre right away. “In less than a year, my son could sing and pray very well, along with the other children at the Mentari Ceria ECD centre. I had taught him how to pray at home before, but somehow he didn’t do that well. It seems the ECD tutors know better approaches for young children. The tutors are so nice and patient, while I used to get easily angry with Habibie. I see how the ECD tutors communicate using a nurturing tone of voice with the children. Soon enough, I also learned for myself how to communicate better with my son. “It has changed me and surely has changed Habibie! Habibie now also likes to teach his younger sister, Alisa, how to sing and pray,” Yeyen says. 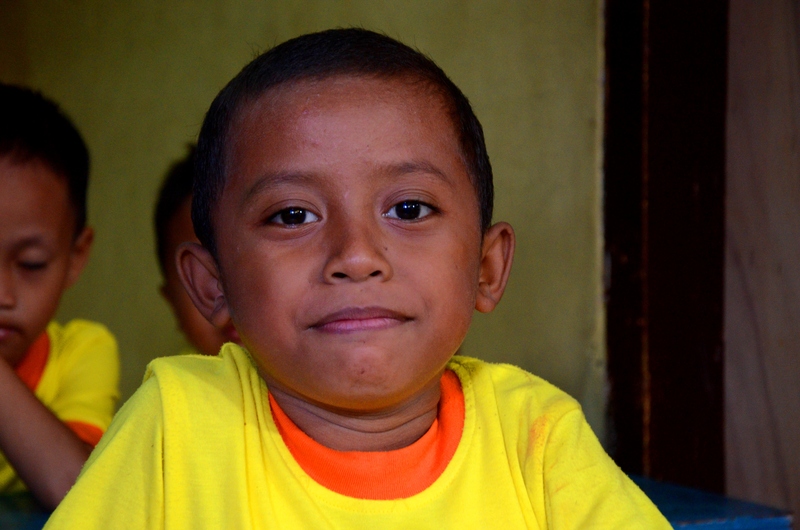 Alisa also goes to the centre, and she doesn’t receive pressure to learn how to read and write early, as Habibie did. Tutors at the centre have been provided with training in early childhood development, which they pass on to parents and caregivers, aiming to create a safe and caring environment with healthy interaction between adult and child. You can help ChildFund establish an Early Childhood Development Centre in the much needed Zavala District, in Mozambique: donate to our Direct Action project now!